Robert Parker's Wine Advocate 01/01/2003 Considerable amber at the edge is evident in this dark garnet-colored wine. With a big nose of sweet maple syrup intermixed with foresty notes, plum, fig, and currants, it is sweeter and riper than its more famous sibling, the 1975. 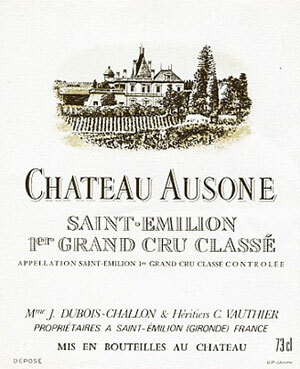 In the mouth, the wine shows some hard edges and angularity, which is so typical of Ausone, but there is a lot of character and a concentrated, medium-bodied mid-palate. The finish is paradoxically both sweet and sour, with ripeness and glycerin, but at the same time, high tannin. Seemingly at a plateau of maturity, this wine could easily hang at this level for decades. Anticipated maturity: Now-2020. Last tasted, 1/02.